I'm designing a no-data USB cable : How should the end be marked? I'm specifying a dedicated USB cable for a product, but it won't be a full cable, it will be missing the center conductors. In other words, it is functionally equivalent to a "charge only" USB cable. What graphic treatment might work, so consumers don't later confuse this with a full USB cable capable of transmitting data? I've checked with the USB implementors forum, and there's no dedicated logo for this case. Update in response to all the comments: I'm a consulting engineer, and don't set the project specifications. Here my client wanted the most flexible possible flat cable. My client's needs come first. The power wires needed to be at least 22 gauge given 2 amp draw over this 2 meter cable (note the unjacketed copper bundles with nylon threads to make up the missing strength). Adding the data wires would add stiffness with no immediate increase in functionality for my client's product needs. The described cable is meant to power a given product. It's irrelevant what the device does or does not do with data lines. 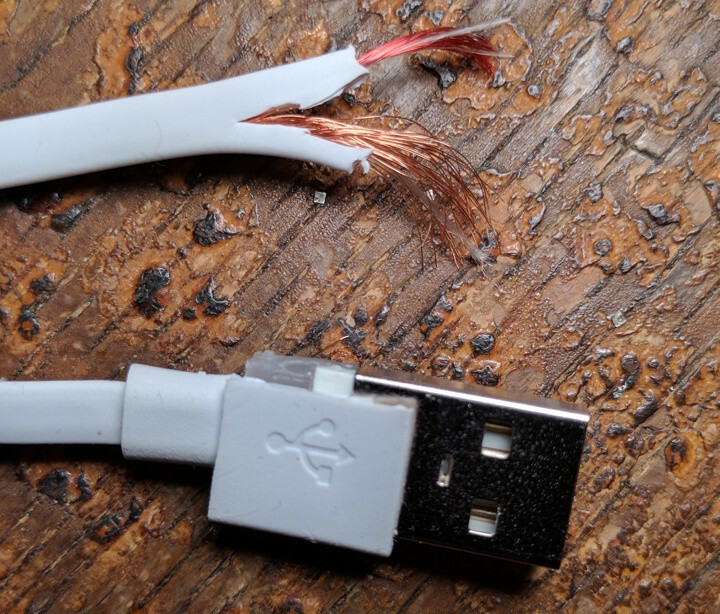 The UX question on the table is how to mark such cables to lower user frustration later, when the cable gets stuffed in a drawer after the product itself is obsolete. Unfortunately such cable is not compliant with USB specification, as even in usb power delivery the data lines are used to negotiate power. You should not mark it with USB (or even USB-like) logo at all. Plug's distinctive shape is informative enough to be easily recognizable as in "where does this plug go". I concur with other answers suggesting lightning-shaped logo and red color (if you can have the color). 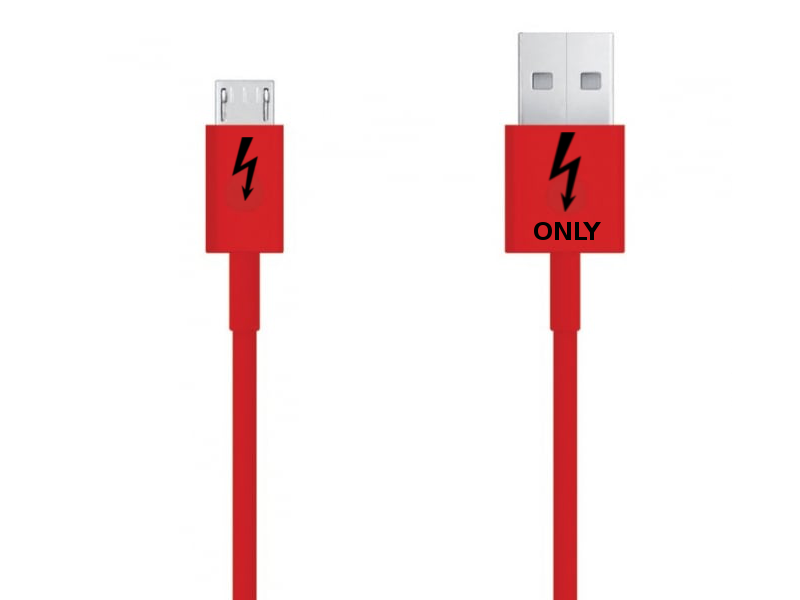 Perhaps even go further - if your cable is designed to safely charge smartphones from untrusted sources, then feature your "data isolator" logo. In other words: highlight what the cable doesn't do (how it's different) instead of what it does. //edit: nekomatic's answer made me realize that these days a battery icon conveys "powering" way better than a lighting-shaped one. Even if the power is continuous instead of charging. You can never beat straight text ("Power Only"); that way, there can be no confusion. It would be nice to look to the creator(s) of the standard USB icon for inspiration, meaning and thus cues for how to adapt it to mean "power only", however one seems to find only many references to Neptune's trident and how the shapes represent "many devices". Example. I have also seen anecdotes from the walled garden of information that is Quora claiming that the Circle and Square represent 5V and Ground respectively (the triangle represents data), but I think this is completely unverifiable speculation. 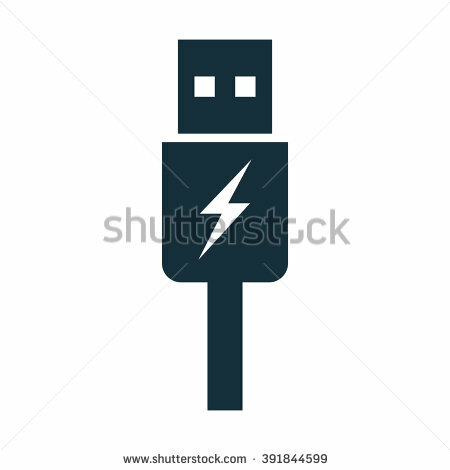 You may like to consider a hybrid logo between some sort of lightning bolt and the USB logo perhaps, but I think that as there's no clear understanding or agreement on a deeper meaning to the logo, even among members of the public, I'd be careful when changing the design. Having thought about it some more, really, the problem is that no matter what you put there, the user isn't likely to pay attention to the subtle (relatively speaking; one cable looks like another and statistically speaking they behave very similarly) marking on the plugs and learn the hard way after several futile minutes of trying to get their device to communicate. 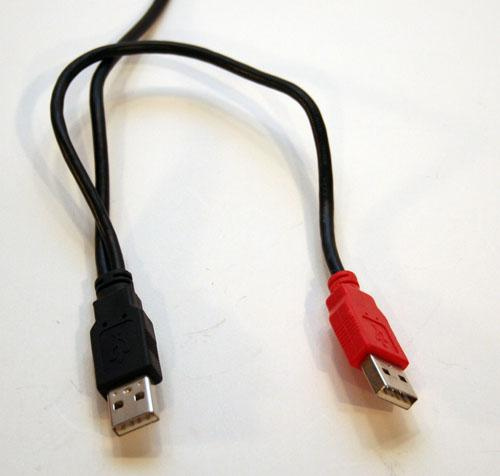 Depending on the economics of the situation, what you could do instead is have a cable that looked fundamentally different to normal cables (different plug shape, plug color, cable color, cable material, etc) to grab the attention of users, so that they they would be more likely to investigate further to determine the cause of discrepancy. Another datapoint: I found such a cable while tidying an office. 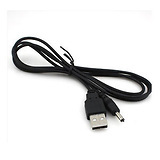 It was a standard-looking black USB cable with a label tag saying "NO DATA". As others have stated, icons are unlikely to be seen. As this question shows, a common way to solve this is to make the cable end visually distinct using colour. In this case, the red end is power only. You could combine both ends, using a ⚡ or ⏻ symbol and the colour red. That would probably be useful for people with colour blindness. Colouring one end differently, and/or attaching a label with text e.g. POWER ONLY NO DATA as well as any symbol used, could also be helpful cues to differentiate the cable from a standard USB one. Whatever graphical treatment you apply to your product, it will never fully convey the difference between 'charge-only' and 'charge and data'. Users are too busy, too ignorant (not in a bad way) or too indifferent to pick up on the minor change in something that's often barely visible in the first place (think about someone reaching around the back of their PC under their desk to plug one of these in). 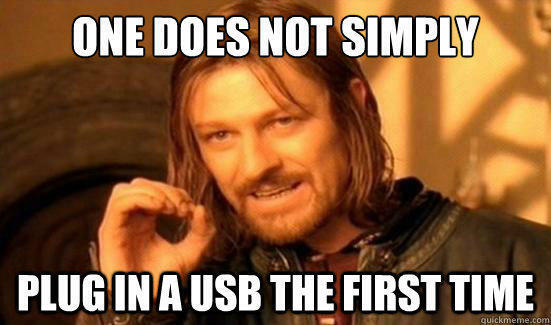 USB already has UX issues 'One does not simply plug in a USB first time', so the very existence of another type of USB cable, one that does one thing less than the standard one, will definitely create more confusion, never less, than at present. No doubt there are pressing commercial reasons why you have to have yet another cable that does something fractionally different than the standard cable, but this will not benefit the user experience, only cause confusion. As your cable does less, not more, than the standard, very cheap, popular and versatile version, I would question whether this product needs to exist at all - but it's your call as to whether this is commercially viable business opportunity. 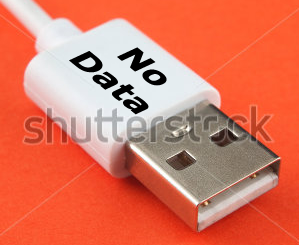 What about something simple like the text "No data"? Should convey the meaning clearly enough. Once you've found a bad solution and all the other solutions are worse, it's time to look at the other other solutions. A great example for this is Windows 95, which required the user to click on "start" in order to "shut down". The reason was that the designers couldn't find a better place to put the "shut down" button. The simple solution was to look beyond where to place the "shut down" button and instead remove the misleading "start" label from the Windows button. Kill the data line in the device instead of in the cable. Don't use a USB connector. 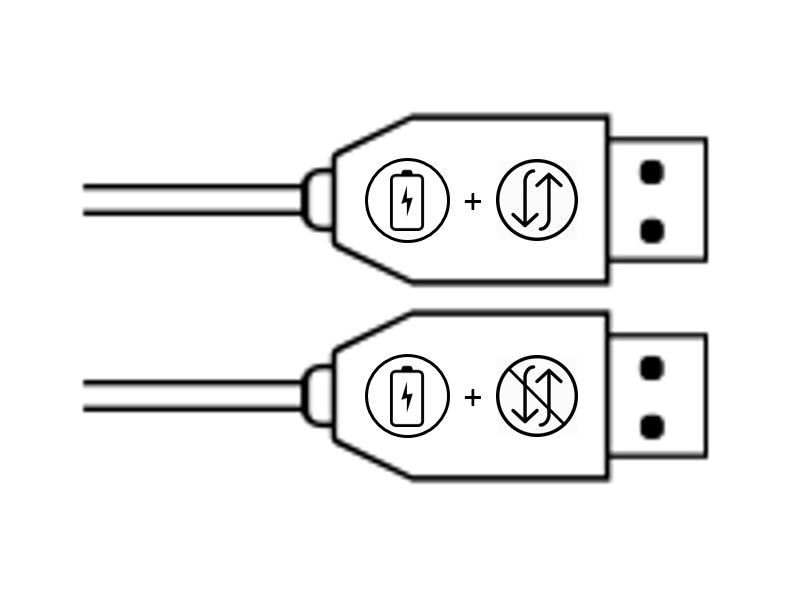 Hundreds of other power connectors exist, and some of them are even standardized. If the cable is the product, make it an adapter instead of a cable. 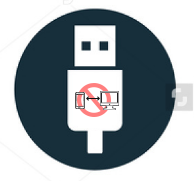 If people have a USB adapter with one end USB A male and the other end USB A female, they will be far less likely to use it accidentally, and will be inclined to look at the label. In this case you have much more space than you have on just a connector, so I'd suggest using a descriptive product logo instead of just a descriptive label. The logo would then depend a lot on the product name ("BugKill", "AllPower", "USBCondom", "SaferCharge"). @TernaryTopiary has a great answer, I wanted to add some thoughts in case they are useful to determine a solution. The "No data transfer" approach tells what the USB cable doesn't do. 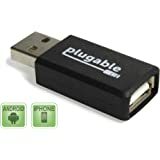 It assumes the user knows that a common USB can transfer and/or charge. So it is telling "Doesn't transfer data" explicitly but "Transfers energy" implicitly. About the symbol it could be Arrow up & down crossed, "No data transfer" (but I guess you are looking for symbols). 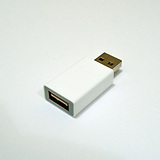 USB already has UX issues, and the user isn't going to pay too much attention to what's on the connector in any case. The real question here is how do you want the user view the cable? Do they see it as "the special cable that goes with product X" or do they see it as a normal USB cable, thrown together with all the others in the cable drawer? make the entire thing some bright color that goes with your brand. (Apple does this with white). You can do mylar over the cable to change the color too. put a special, unusual connector on the other end. My fitbit does this. It's now "fitbit cable" in my head. combine the above for best results. make it work like normal (with data pins). disconnect the data pins from inside the device itself. then you don't even need to make your own cable. You can make the cable very short and use it together with ordinary USB cable. That way users are won't use your power-only cable as extension cord, because it's too short. I don't think your going to convey the existence of a charge only cable with just an icon. No matter what you do, your going to have people that get upset that there cable isn't connecting. So instead I suggest you use a more tactile approach. Have it be a two part connection. A round part like common DC transformers, that slides into a USB shaped adapter. You don't have to increase the product size, but the pull off end, and the physical activity, along with the common shape of the round part, and maybe even a blinking "charging" light, will certainly get the idea across. You want the product to fit in a USB hole, but you do not want it to look (or work) anything like a normal USB cable. Also keep in mind, you will need to avoid calling this USB in any way. USB and it's logo are actually licensed for use, and you have to meet certain criteria in order to call your product USB compatible (though there are lots of ways around it). I think more or less this question has been answered. A good symbol communicating that data transfer cannot happen with this cable is needed. An example is shown below that shows the cell and PC with a blocked icon in the background. 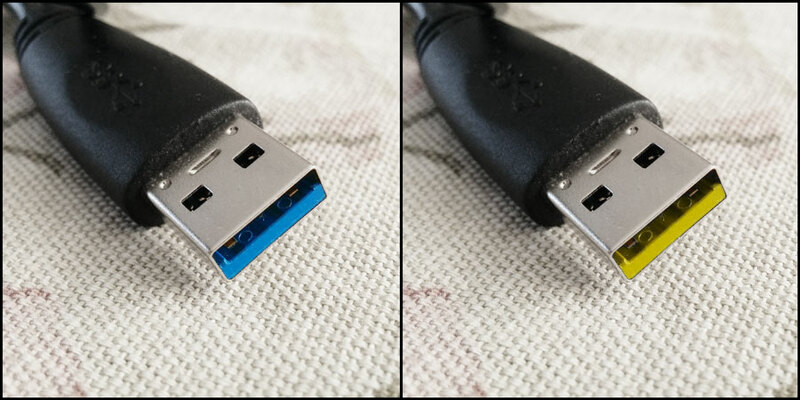 Similarly to how USB 3.0 plastic uses blue ("Pantone 300C") color coding to differentiate it from USB 2.0, a unique color could be used for Power only USB. USB 3.0 on the left, proposed yellow on the right. My first instinct was to use an image of a condom (since that's the colloquial name where I'm from for cables/adapters that don't carry data) but I could see how some people could be offended or parents who would be worried about their kids asking questions. I think I'd go with a USB logo with a shield over the spot where it "forks". You got plenty of answers already, so heck I'll throw in my two cents too. I'm going to go ahead and disqualify my own answer here too, or Stack Exchange will yell at me. 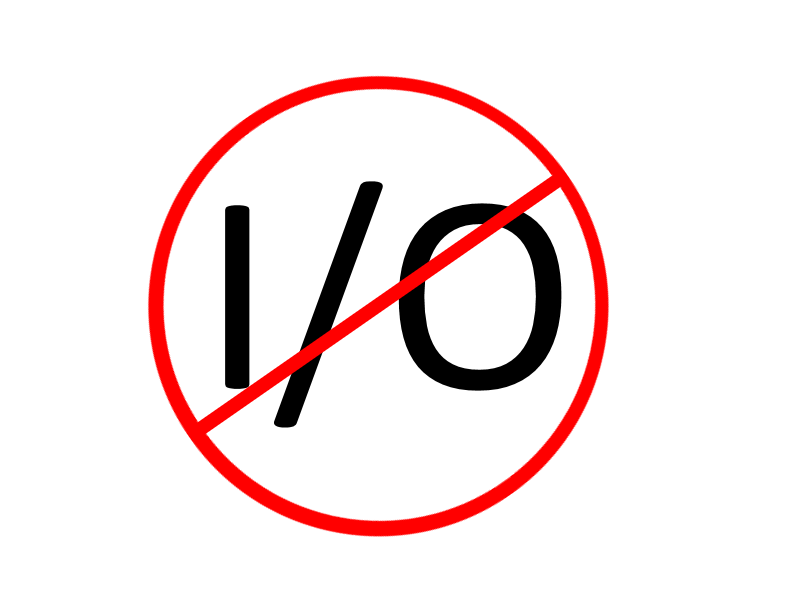 There's only one huge, glaring problem with my suggestion: I/O can also represent power. You're probably most familiar with seeing it on the backside of power supply switches. In this case, it represents a Open or Closed circuit, as you would close a circuit electrically. So yeah, there you go. People have been asking about a symbol that represents "data", and this is the most universal one I can think of. It still suffers from the same cable marking pitfalls others have mentioned, that people don't look at cable markings. I would either go with the lightning bolt (Apple doesn't own it) or making the cable visually stand out, as a different color or shape. Red color is a big flag. The vast majority of USB cables are black or white, if I see a red USB cable I will think there's something different about it. Put a voltage/current/power logo, preferably at both sides of the connector and even better if you put that logo at both connectors. That way it will show up that that cable was designed for power supply. Make it as visible as you can, color contrast is the key. Not decided yet between black or white. If there's enough space, put an ONLY text next to the voltage/current/power logo to show up that it will only supply power and nothing else (no data transfer). Not the answer you're looking for? Browse other questions tagged icons physical or ask your own question. How should a grid of apps rotate when the device is rotated?